Visual Studio 2013 extension to change Visual Studio "hidden" option for project loading to reduce loading time and memory usage for big solutions. Visual Studio solutions can contain a large number of projects. The default Visual Studio behavior is to load all the projects in a solution at the time the solution is opened, and not to allow the user to access any of the projects until all of them have finished loading. When the process of project loading will last more than two minutes, a progress bar is displayed showing the number of projects loaded and the total number of projects. The user can unload projects while working in a solution with multiple projects, but this procedure has some disadvantages: the unloaded projects are not built as part of a Rebuild Solution command, and IntelliSense descriptions of types and members of closed projects are not displayed. Developers can reduce solution load times and manage project loading behavior by creating a solution load manager. 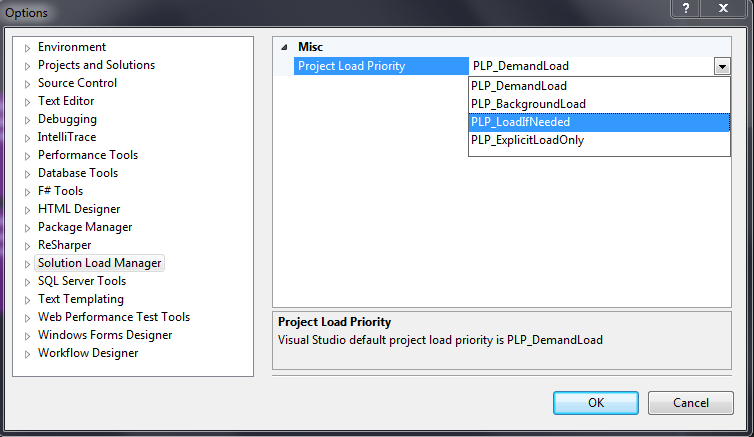 The solution load manager can set different project loading priorities for specific projects or project types. The most optimal option for big solutions is "PLP_LoadIfNeeded"